After World War II, ten million veterans came home to a massive housing shortage. Many of them were marrying and starting families. Decent apartments were scarce, and single-family homes were too expensive for many vets. In New York, where it was common for multiple generations of families to live together in urban apartment buildings, the time was ripe for another option that offered something new, modern, and accessible by the masses. Enter the Levitts. Brothers William and Alfred, together with their father Abraham, set about developing a neighborhood on former farmland in Nassau County, Long Island. Their approach owed much to Henry Ford - and not only for the increased mobility made possible by the rise of the automobile. The Levitts also applied Ford's principles of mass production to home building, innovating assembly-line construction methods that allowed homes to be constructed quickly and inexpensively. By the middle of 1948, the company was building 30 houses a day in Levittown. William Levitt, himself a returning Navy man, brought to the project his wartime experience constructing military bases - efficiently and in a manner that in the private sector could be quite profitable. The Levitts' innovative approach made it possible to offer a home with modern conveniences such as a washing machine, refrigerator, and dishwasher for less than $7,000. Federal Housing Administration loans took this accessibility a step further, offering no-down-payment mortgages with monthly payments lower than most rents. Thanks in large part to this federal underwriting, Levittown was so successful that two more Levittowns took shape - one in Pennsylvania and one in New Jersey. But if Levittown was symbolic of the American dream, it was also symbolic of American segregation of the time. 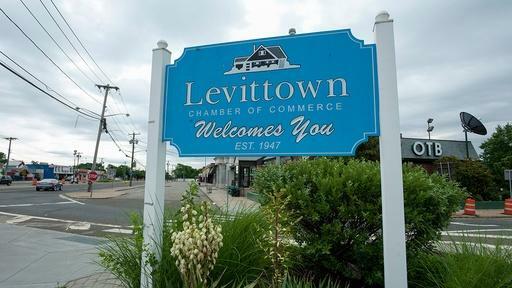 Levittown, under the Levitts' direction, attempted for years to enforce restricted covenants that excluded non-white residents and remains infamous for this discrimination. See a Levittown home constructed in one day. 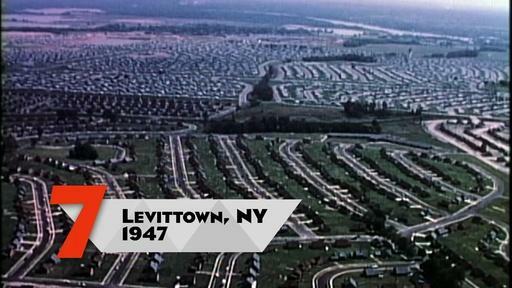 Watch a short documentary about racial integration in Levittown, Pennsylvania. Explore the Levittown history collection at the Levittown Public Library. Levittown brought an assembly-line building approach to postwar housing.